Valeant's struggles continue, and risks associated with sluggish sales and debt covenants remain big. Valeant Pharmaceuticals (NYSE:BHC) shares have lost more than 90% of their value, and news that longtime shareholder and company cheerleader Bill Ackman has sold his stake added to those losses this week. Although the company's shares are undeniably on the clearance rack, here's why I'm not buying. Valeant's fall from grace has been swift. Following revelations of its unsavory practice of buying long-standing drugs only to jack up their prices by several hundred percent, scrutiny eventually led to the shuttering of its pharmacy distribution partner Philidor Rx, and the arrest of key executives on charges of corporate fraud. The response to Valeant's struggles by customers hasn't helped matters. Frustrated by the discovery that they've been paying too much for medicine they didn't have to cover, payers have embraced generic alternatives to some of Valeant's former top sellers. Dermatology sales have been especially hard hit, in spite of efforts to kick-start demand by inking a distribution deal with pharmacy giant Walgreens, and as a result, Valeant's sales have tumbled, and taken profit down with it. 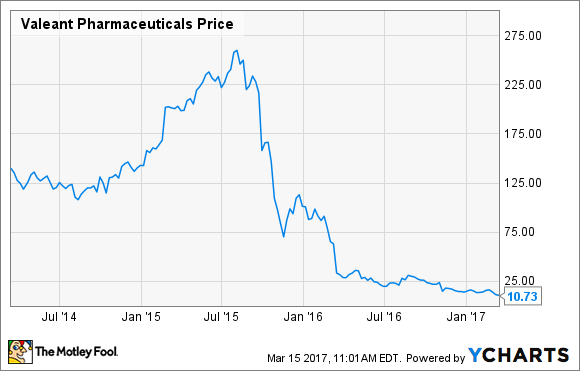 Given Valeant owes a mountain of debt because of its previous buy-reprice-relaunch strategy, that's a bad combination. Hedge fund manager Bill Ackman cozied up to Valeant in 2014 when he teamed up with former Valeant CEO Mike Pearson in a failed attempt to acquire Allergan. Allergan repeatedly rebuffed Valeant's cash and stock acquisition offers, saying that Valeant's business model relied too heavily on acquisitions and not enough on organic growth. That argument was echoed by sellers, including the well-known Jim Chanos, who established short positions in Valeant because of concerns due to its acquisition-focused business model. Although the acquisition attempt failed, Ackman still pocketed more than $2 billion in gains on Allergan stock he owned, and following that success, his hedge fund, Pershing Square, eventually became one of Valeant's biggest shareholders, managing a stake that totaled more than 27 million shares (plus call options) that at one point was worth roughly $5 billion. Unfortunately, Pershing Square's big bet on Valeant was ill-timed, and the company's stumbles have taken a big toll on the fund's performance. Ackman told CNBC last May that he regretted buying those initial shares in Valeant, but that he thought Valeant could be fixed, and that Joseph Papa, Valeant's new CEO, was the right industry veteran to fix it. Ackman joined Valeant's board of directors last March, and Papa was hired in April. This week, however, Ackman finally conceded that his bet on Valeant was a bad one when he sold his entire stake at a staggering loss that likely totals in the billions of dollars. Valeant's previous drug pricing and distribution scheme aside, efforts to turn this big drug company's fortunes around has proven incredibly difficult. Its nearly $30 billion in debt includes secured debt with strict financial covenants, and because profit has fallen, Valeant's interest coverage ratio has fallen to levels that have hamstrung management's ability to continue making acquisitions. As a refresher, the interest coverage ratio is calculated by dividing EBITDA, or earnings before interest, taxes, deductions, and amortization, by interest expense. Instead, the company's had to rely on a strategy that includes refinancing debt, renegotiating debt terms on existing debt that can't be refinanced, selling assets, and rekindling organic growth -- something that's arguably new territory given its past business model. So far, it's made progress on some of these goals, including renegotiating its debt and selling non-core assets. Last August, management convinced debt holders to lower the interest coverage ratio covenant associated with default to 2:1 from 3:1, and earlier this year, it sold skin care products and a prostate cancer drug, raising about $2.1 billion. Hopes to stabilize product sales, however, have fallen short. Despite its distribution deal with Walgreens, dermatology revenue continues to decline. Last year, branded prescription drug revenue, which includes sales of its dermatology products, dropped to $3.1 billion from $3.6 billion in 2015. Recently, management also reported slowing growth for its core asset, Bausch & Lomb. Once a double-digit grower, revenue in its Bausch & Lomb and international segment was about flat in 2016 compared to 2015. Based on those sales trends, Valeant's guidance is for companywide revenue to slip by as much as another 8% in 2017. The decelerating sales also has management guiding for EBITDA of between $3.55 billion and $3.7 billion, and since its interest expense is around $1.8 billion, Valeant's interest coverage ratio could get dangerously close to the 2:1 default covenant this year. Stabilizing sales and profit are key to Valeant's long-term survival. If it can find a floor on revenue and costs stay in check so that EBITDA expands, then debt refinancing and renegotiation efforts could allow the company to remain above water. Whether Valeant can accomplish that feat, however, is a big question. Sales and profit aren't yet heading in the right direction, and until that happens, there's just far too much uncertainty here for me to want to risk owning Valeant's shares.